Seven months and one day after President Trump surprised the Joint Chiefs chairman by ordering up a new branch of the military, the president has formally declared what he wants: a new branch under the Air Force, something like the Marine Corps under the Navy Department. For now, at least, the proposal will call for the Space Force to rest under the Air Force, not be the “separate but equal” branch Trump called for last June. A separate force remains the ultimate goal, a senior administration official said, but officials determined they could get more bang for their buck by putting the new service branch within the Air Force. “What we’re saying in the space policy directive is that remains a goal, but what we’re trying not to do is do it all at once,” the official said. “We’ve heard the concerns from Congress about not creating a large bureaucratic organization and I think our thought was if we started going directly to a military department, which is … our desired end state, that we would spend a lot of time dealing with bureaucracy and structure and not focusing on warfighting. Trump administration officials say the Space Force is needed to defend against Russian and Chinese attempts to interfere with U.S. satellites, which the military and commerce rely upon. “The Space Force will organize, equip and train the next-generation of warriors to deter aggression and defend the nation, our allies and American interests against hostile actions in the form of space and taking place in space,” the president said Tuesday. Last week, Defense One reported that Acting Defense Secretary Patrick Shanahan is expected to put Air Force Secretary Heather Wilson in charge of the detailed planning for the proposed Space Force. 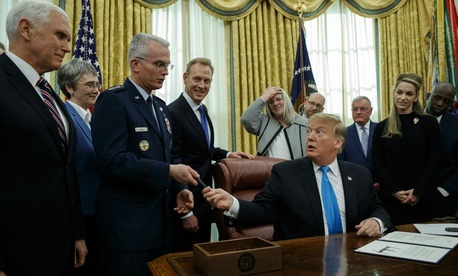 On Tuesday, Shanahan, Wilson, and Gen. Paul Selva, vice chairman of the Joint Chiefs of Staff, assembled behind Trump in the Oval Office to watch him sign Space Policy Directive-4. “We will deliver capability better, sooner and faster so we can sustain our margin of dominance,” Shanahan said. Administration officials declined to say the specific cost for the new service — only that it would be in the “low, single-digit billions.” They said those numbers would be included in the Trump Administration’s 2020 budget proposal, which is expected to go to Congress in mid-March. In November, Shanahan, who has been overseeing the creation of the Space Force, said it would cost “single-digit, not a double-digit” billions of dollars to create the new branch. “It might be lower than $5” billion, Shanahan said. In September, Air Force Secretary Heather Wilson said the Space Force would cost $13 billion over five years. Wilson’s estimate was for the creation of a separate, standalone military department as well as pulling the National Reconnaissance Office and other intelligence community space activities into the Space Force.